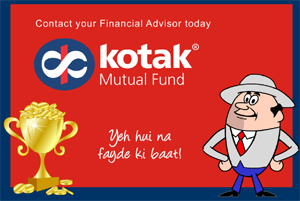 Kotak Mutual funds leading fund house has made video explaining asset allocation with taking cricket analogy. Let’s check out what this video says about asset allocation. Faydelal says that best way to win wealth cup is by adopting “Money ka many strategy”. In cricket we cannot have a team that filled with only good batsman or only good bowler. We must have winning combination if my batsman fails to perform my bowler will win the match if both fails to perform at least my fielder will save the day. Just like that your investment also needs winning combination. That winning combination is asset allocation. Asset allocation comes by investing in various mutual funds schemes. Through asset allocation your money is allocated across various investment categories such as “Equity”, “Fixed instrument” and “Gold” if one category fails to perform, the rest will make up for it. It is smartest way to manage risk. Just like a good cricket team has a mix of player with different skills. Asset allocation helps you to achieve the right mix for your investments. If long term wealth creation is your wealth cup then asset allocation is your team to win it for you, because one can lead to none but many can make Money. Now as you know this secrete apply this secrete of money ka many and score the winning runs. Do share this video with your friends on Facebook.